10.00am – Natural History: Origins, queen, workers and drones, function of castes and genders, individual lifecycles. 11.45am – The Management of Bees: The beekeeping year, hives – further considerations, apiaries and their pros and cons, inspecting a colony. 12.30 – Warming, straining and bottling, preparation of soft set honey, labels and legal matters. Components of honey. Honey quality issues. 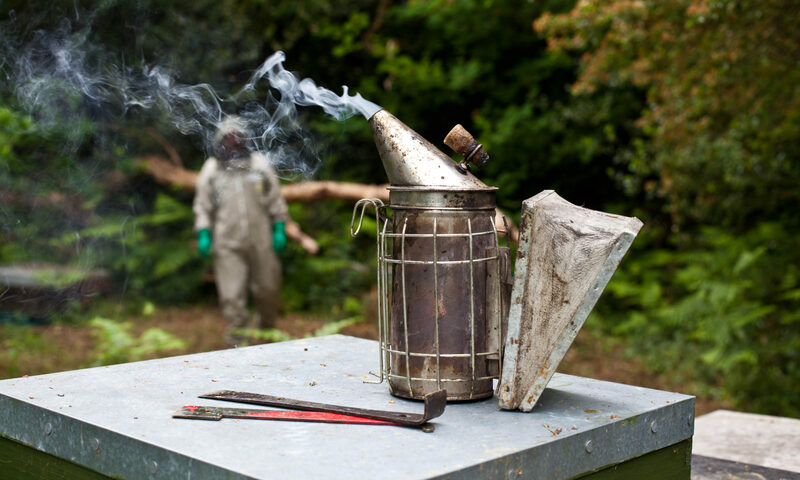 9.30 – Put on bee-suits and lighting smokers. Basics, inspecting a colony: 5 good reasons for inspecting a colony. 1:40pm – Swarm prevention and control – Demaree, artificial swarm, queen removal to a nuc. Dealing with a difficult colony, uniting and re-queening. 1.40pm – Feeding, practical demonstration how to assemble a brood box (National). Making up frames. This course was developed by Rudy Repka who has delivered it for many years. From this year Ian Stell is taking over the leadership. He is a Master Beekeeper who has kept bees for over 20 years and has published on bee science (bee anatomy). Rudy will still be involved as will a number of other members of Sidcup Beekeepers Association for the practical sessions. Some straightforward homework may be recommended to help support the information to be taught on the course. The names of recommended textbooks will be provided in advance of the course. These are not essential. Tea, coffee are provided however lunch is not provided as part of the course. Packed lunches may be brought for the practical days or lunch obtained nearby. Recommendations will be provided. A notebook and writing materials are recommended for the classroom based sessions. Handouts will be provided. For the practical sessions please dress appropriately to be outdoors all day. Bee suits will be provided. If the weather is warm these can become warm to work in. Therefore it is helpful to wear layers that can be removed if the weather is warm. Please bring your own wellington boots. Smokers and all other equipment will be provided. There is a clubhouse to shelter in if necessary from rain showers. If a practical session needs to be cancelled as too much rain is forecast then an alternative date will be advised. This will probably be the first Saturday in May. Information will be sent out by email. The numbers on this course are limited to 24 because of the practical sessions. Bookings need to be made directly with Ian Stell (unless already arranged with Rudy Repka). A deposit of £25 is required to secure a place. Full payment is required by Saturday 16th February. Payment should be made by bank transfer (BACS) to: The Catford Press Limited. Account: 20170602. Sort Code: 602477. Please include your name as the payment reference. Please email ian.stell@btinternet.com once any payment has been made. Receipts will be provided.